Welcome! The Geek Industrial Complex is devoted to the development of Open Game License gaming material. "A non-optional purchase if there ever was one." Pathways e-zine from Rite Publishing just released Endzeitgeist's Top Ten of 2013 list in issue 36 of Pathways. I'm proud to report that Companions of the Firmament came in at #2! Thank you Thilo Graf for the uplifting recommendation. I'm humbled to see the accolade. Check out the mini-review along with what looks like a mouth watering list of other excellent PFRPG products in the latest issue. The internet is marvelous isn't it? Geeks all around the world have been benefiting, and being ahead of the pack, for decades now due to the internet. After a couple of decades of hammering away at playing RPGs online the technology has matured enough that we have robust tools to emulate as much as possible the tabletop experience, and it's all free! It is exciting to see the birth of Virtuacon as it gives all of us another avenue to connect up with each other, enjoy the fellowship it brings and play out the games we love. Virtuacon is an attempt to have a virtual convention online focusing on RPGs. Scores of games will be played (many 'tables' are already filled up), industry panels are forming, and prizes are going to be given out. GIC is jumping to the virtual fray to help sponsor the event with plenty of PDF copies of Companions of the Firmament available as potential prizes for participants. Head on over to RPGeek.com and sign up for an online game! Hardcovers have arrived for the Kickstarter backers! Wrangling with proofs that passed muster took longer than expected, but the hardcover copies of Companions of the Firmament have arrived. Shipments will start shortly! The proofs for Companions of the Firmament have arrived! Getting these books finally into my hands is a real joy. While PDF is a valuable resource and option to have, actually being able to hold and flip through a book really captures what was intended. It's time to come up for air with work on the Companions of the Firmament. Months of daily work have been poured into the project, artwork has poured in and layout continues. Above is a glimpse of the cover with the title, along with some internal artwork, both done by Justin McElroy. A beta rough cut of the PDF was just sent out to backers. The holidays are here and after a short break it will be back to wrapped up the work needed to get the files to the printer. The Kickstarter for Companions of the Firmament was a fantastic success. It wrapped itself up with some real surprises which has left me going at a full sprint through August and into September. Among the many developments was the ordering of the art prints as part of the Kickstarter rewards for several backers. They have arrived and I'm very happy with how they turned out, including the top tier reward with the stretched canvas art print for the projects "Angel Investor." Artwork is an important element to my vision of Companions of the Firmament and so going into this final stage of the campaign the customized artwork reward levels (Pegasus Rider, Griffon Rider, Mystery Rider, Eagle Rider, Champions of the Firmament, and Lords of the Firmament) now have an upgrade to the backing rewards. Each of the above reward levels will now include the 20" x 24" signed and numbered ART PRINT by the artist Justin McElroy. This is a one time limited print run of the artwork and will look great hanging on the wall, inviting people to spend some time gazing at the art and perhaps finding something new each time. Here Be Dragons, Part II! Creature Sheet Artwork is done! The stretch goal artwork is rolling in now. Creature Sheet #3 is now done, focusing on Dragon with artwork by Justin McElroy. One approach to flying mounts in the system is to get a monster cohort, however dragons have not been included in this approach. 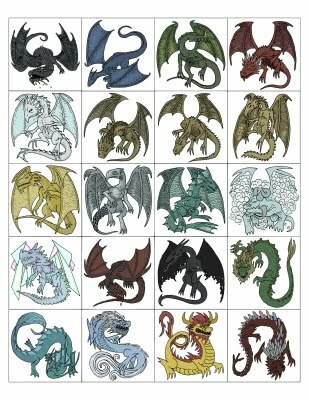 Companions of the Firmament fixes that by laying out having dragon cohorts, detailing all 20 different dragons (chromatic, metallic, primal and imperial) when they are right around the young age of development. This creature sheet gives you black and white line art or full color tokens that you can print, cut out and then mount on heavy card stock so you can easily represent them on a battlegrid, and effortless show if your character is mounted or not simply by placing your figure on the token. You can also use them as an inexpensive resource for flying opponents in your campaigns. Black and white line art is available for those who want to spend less on printing, or would like to color their dragons. Pick on of the twenty, pull out some colored pencils or markers and customize your dragon just the way you like! Monster Sheet Stretch Goal, We're almost there! We're just shy of hitting the second stretch goal for the Monster Sheets. It's like the next backing will upgrade the stretch goal so that 100 monster sheets will be prepared for all backers. Companions of the Firmament Kickstarter is gliding along right now. We're just over halfway through the crowdfunding campaign and we've more than doubled the original funding goal! Stretch Goals are now move along as well. Two new creature sheets are out for commission right now, hopefully that new artwork will be available soon, and the first Flying Monster Sheet stretch goal has been reached. What a week it has been! The Companions of the Firmament Kickstarter reached it's funding goal in about 60 hours! Now it keeps gliding along on a warm updraft to gain even more altitude. Stretch goals are being laid out and it looks like it will be an exciting month ahead of us. If you enjoy listening to podcasts then head on over the Carnagecast where Tyler Dion interviews me about the Companions of the Firmament, the Kickstarter, along with Geek Industrial Complex. Bombs Away! The Kickstarter for Companions of the Firmament is now live! So much work has gone into getting just to this stage, but it has been a wonderful learning experience and I'm already proud of what has been assembled. Hopefully all the lessons I gained from the Crowdfunding Report will pay off. Thank you to my wife, friends and relatives who have all been so helpful and encouraging through this buildup. One chapter ends, and a new one begins! Just a few days away from starting the Kickstarter! Here is a zoomed in preview of the cover art for Companions of the Firmament, done by Justin McElroy. While it's the official image for the CotF Kickstarter project, it's going to be covered up by a video that is in the works right now. So I wanted to make sure someone sees it before the video goes up. The pieces are all falling into place now to begin the Kickstarter soon. Along the way I asked a lot of questions, and got some great answers to a variety of aspects to pulling off the project. I've collected these discussion threads in a new article Zero to Hero: A Journey Towards Kickstarter. Hopefully the crowdsourcing there will help others on their own journeys. More fantastic artwork is rolling in! This time from Justin McElroy, who's delivering up a visual feast that really helps capture the vision I have for this book. Justin's work grabs you and doesn't let go, letting the whole expanse of adventuring in the skies soak in. This web friendly image isn't enough to convey all the detail to discover in this picture, I can't wait to see this in print! More artwork is floating up for the eventual Kickstarter project of Companions of the Firmament. Aegia over on Deviantart did this wonderful piece detailing a new Monk archetype that will focus on harnessing the element of air. Aegia surpassed my own vision and expectations with this piece. Thank you Aegia! The final piece in the RPG Crowdfunding Report is now in place with the release of the raw data used to generate the report. It took awhile to collect it together from different files, clean it up and then wrestle with the Creative Commons license, but it's done. People have been asking for this information, and I found it a bit serendipitous when I watched just the other day Tim Berners-Lee on TED exclaim, "Demand raw data now." Well, here it is, fly and be free! Part three of the Crowdfunding Report is now up. It's been a wonderful education going through this survey and analysis. I hope it helps others in their own crowdfunding endeavors and encourages those on the fence to leap off and go create something really cool! It's also a relief as I'm now free to put all of my energy towards Companions of the Firmament, which I hope should be ready to be Kickstarted within the next month. Art as arrived! An excellent piece by Ian MacLean was done for Companions of the Firmament. When I asked Ian to create this piece I was hoping for something that really gave a sense of the joy of flying, a huge vista to take in and and a sense of freedom. Ian deftly hit on all of those themes. It was great working with Ian and look forward to even more collaborations with him. Also, part two of the Crowdfunding Report is now up on the page! It took a week and half and another pass through the data to finish, but it's finally here. There was so much material generated that I'll have a part three in the works. A new article is posted, 2011-2012 Crowdfunding Report on 150 RPG Projects, Part 1 which details research I have been doing over the last month on how best to go about running a Kickstarter project. There is plenty of excellent advice online, however I wanted to get a better idea of the RPG crowdfunding market through some evidence based decision making. It was a grind, but I gathered data on 150 RPG related projects on different crowdfunding sites that have occured over the last year. The link above goes to part one where I focus on the big broad numbers. Also, I should have done this a long time ago, but I finally put up Geek Industrial Complex's Facebook page. Go forth and be liked GIC! The GIC Product page has been reworked to reflect the development of what had previously been the Wyrm Rider project. The content is greatly expanded and now covers a wide range of topics related to flying in a campaign. In late March I decided that to do a Kickstarter project properly what I needed was more precise data on how RPG crowdfunding projects have performed. So I began collecting data on RPG related crowdfunding projects that have occurred over the last year. I've now collected data on 150 projects and I'm in the middle of doing some data analysis. The lessons derived from the data alone is very helpful, but I have to say that what was equally helpful was just grinding through 150 different projects. There is only so much that can be captured on a spreadsheet, what gets missed is a lot of the stylistic approaches and general tone that different projects had. I'm working on a report to present to the RPG community on my findings. In part it's just helpful to me to get my thoughts in order from what I found, but I suspect it will be useful to many other individuals who are considering using a crowdfunding model to get their work into print. After much consideration I've decided to switch gears in how I'm approaching the development of products. While crowdfunding from Kickstarter has been something I have been considering for some time, having looked at the broader scope of what I want to accomplish it seems like this is the best route to creating the kind of OGL products I've always envisioned. Because of that I'm reworking my Wyrm Rider archetype product and merging it with other design work I had been working on to make it a much more expanded product. There has been excellent data coming from playtesting for the Wyrm Rider. It has really helped frame the scope of the archetype and has raised other design possibilities. I had hoped to get more frequent updates over the last couple of months, but the design process really gets slowed down when there are hangups in play testing. Work on the GIC products continues, but in the mean time I have a few new PDFs available for download. First is the Arrow Packs, which is a handy sheet for the archer character who wants a well organized set of quivers so that the real versatility of the bow can shine. The second PDF is the Handy Haversack Pack. Recently I had to make a fresh 7th level character and was confronted with the chore of having to buy up all the little bits of gear that one ought to have by that level. I decided to put together a single sheet that you can just grab, cross off the gold and have a complete set of gear bundled into the Handy Haversack wonderous magic item. Enjoy! The Geek Industrial Complex (GIC) is finally coming together! Like moss slowly creeping up a tree, I've accumulated over 30 years of gaming experience, spanning the wide range of options that geekdom offers. Now I plan to gather various sundry items together in one place and offer them up to the hobby. Enjoy!